Silver Star Brands’ headquarters is based in Oshkosh, Wisconsin. Oshkosh is located in Wisconsin’s Fox Valley, named for the Fox River running through the region. The Fox Valley is part of the New North, an 18-county region of Northeast Wisconsin that makes up Wisconsin’s third-largest economic area, after Madison and Milwaukee. The area is known for its low crime rate, educational opportunities, stable economy, affordable cost of living, access to top-rated health care and recreational opportunities. 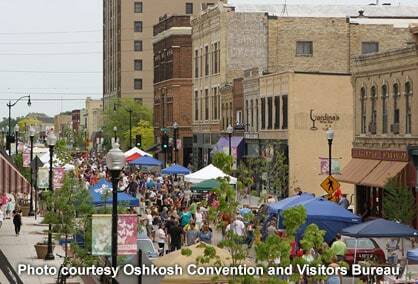 Home to 65,000 residents, Oshkosh is known worldwide for its hospitality. Oshkosh annually hosts more than 1 million visitors, who are attracted to live outdoor music concerts and festivals, sporting events and art exhibits. More than 500,000 people attend Oshkosh’s largest event—EAA AirVenture Oshkosh, a week-long aviation celebration that includes daily air shows, educational programs, music concerts and more. Tens of thousands of people enjoy outdoor music festivals including Country USA, Rock USA and Lifest, a Christian music festival. Learn more about Wisconsin’s Event City by visiting the Oshkosh Convention and Visitors Bureau. The city is home to cultural amenities, including museums, live-performance theaters and music venues. The Paine Art Center and Gardens historical estate features art exhibits and lush gardens. The Oshkosh Public Museum provides a glimpse to Oshkosh’s past while hosting traveling exhibits the whole family will love. The EAA AirVenture Museum brings to life more than a century of aviation history. Oshkosh takes full advantage of its location on the shores of Lake Winnebago, one of the nation’s largest inland lakes. The Lake Winnebago system and Fox River make it possible for boaters to travel to nearby communities by boat. And, that’s only the beginning. Residents and visitors enjoy a range of water sports, including sailing, kayaking, fishing, ice skating and ice-boating. Land-lovers can witness native wildlife species up close as they hike Terrell’s Island, a 3-mile seawall along the Lake Butte des Morts Wildlife Area. The WIOUWASH Trail, a rails-to-trails conversion, connects neighboring counties of Winnebago, Outagamie and Waupaca and Shawano and provides miles of flat, gravel trail bed for hikers, bikers and horseback riders. The paved Tribal Heritage Trail celebrates the heritage of Wisconsin’s 11 Indian Tribes, along Interstate 41 and is popular with hikers, bikers, roller-bladers and more. Oshkosh is home to the University of Wisconsin Oshkosh, the third largest public university in the state. With more than 14,500 students, the university offers 60 bachelor degree programs, 15 master’s degree programs and a Doctor of Nursing Practice program. Oshkosh is also home to three Fox Valley Technical College campuses, where students pursue a range of associate degrees and certifications. The Oshkosh Area School District (Oshkosh’s Pre-K-12 public schools), Lourdes Academy (a private, preK-12 Catholic school system) and Oshkosh Christian School (a private preK-12 school system) are known for having students who score highly on state assessment exams. Oshkosh4Education, brings together business and community leaders to support the preK-12 schools in the Oshkosh Area School District. The Fox Valley is so named for the area around the Fox River and west of Lake Winnebago. It stretches from Oshkosh north to Appleton and includes multiple cities in between. The Fox Cities comprises four cities—Appleton, Neenah, Menasha and Kaukauna—and other surrounding townships and villages. More than 200,000 people live in this area. Among the 19 museums in the Fox Cities is one in Appleton dedicated to the famous escape artist, Harry Houdini. Appleton also is home to Wisconsin’s third largest children’s museum, Building for Kids, located in the city’s bustling downtown. Appleton’s downtown draws people from far and near to the Fox Cities Performing Arts Center, which hosts national music and comedy acts as well as Broadway shows. If you prefer outdoor recreation, the High Cliff State Park, located on Lake Winnebago, offers hiking, biking, cross-country skiing, swimming and more. The Fox Valley also has four nature centers and multiple golf courses, including Chaska, recognized in the state as a top public course. The famed Lawrence University, a liberal arts university and conservatory of music, welcomes students from every state and 50 countries. The University of Wisconsin—Fox Valley, part of the University of Wisconsin System, is a two-year campus where students can complete general requirements and earn credits transferrable to just about any bachelor’s degree in the system. It’s also home to Barlow Planetarium, which hosts public shows about astronomy nearly every day of the week. Public and private school districts in the Fox Valley are among the most highly rated in the state, offering families a wide range of options for students. Made up of 18 counties in Northeast Wisconsin, the area is known for its low crime rates, economical cost of living, affordable health care, educational opportunities and recreational amenities. It’s the home of the Green Bay Packers and PGA Championship golf courses. Set on the western shore of Lake Michigan, it’s also home to Door County, an area that rivals many vacation destinations with its 300 miles of shoreline, five state parks, 11 lighthouses, boutique shopping, luxury accommodations and fine dining. People who live in the New North find affordable living options in the city and the country. From downtown historic apartments to single-family homes in the suburbs, housing is available for any taste and income level.